Pingouin Beach a.ka Pink Gin Beach gets its name from the fashionable UK cocktail which consist of Gin and a dash or two of Angostura Bitters. It’s the English way to do Gin. One look at the pinkish sand on Pink Gin beach, and you will see that this beach was appropriately named. Pink Gin boasts a peaceful atmosphere, and pristine waters. Very attractive and fun for singles, couples, or the whole family. Pin Gin beach is south of the popular Grand Anse Beach and Morne Rouge Beach. 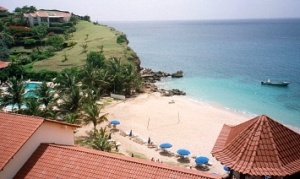 In fact it is the furthest south of all the popular Grenada Beaches. While you will share this beach with other guests from nearby hotels, you won’t find that many locals as say Grand Anse Beach. So if you are looking for more local interaction you will be better of at one of the beaches higher up. Public transport is not an option. Rent a car and drive there yourself, or take a taxi. Want to live close to Pink Gin beach or better yet on Pink Gin beach? You have several hotels within 3 – 5 miles of the beach. Two of the closest hotels are La Source Hotel and Rex Grenadian Hotel. In the case of La Source (pictured to the left), it’s right on Pink Gin Beach. For more nearby hotels browse our Grenada Hotel Accommodations directory. Photography: pink gin beach, La Source Hotel by jimg944. Further up the road before you get to Pink Gin Beach is Aquarium Restaurant, a favorite among Grenadians and visitors alike. They feature a good selection of cocktails, good seafood, and a Sunday beach barbecue. Drop in for a light snack, or lunch to complement your day on Pink Gin Beach. Here’s what else I think about Aquarium Restaurant. You should also explore the restaurants and cafes at the nearby hotels, or even check with your hotel to see if they offer a picnic basket service.